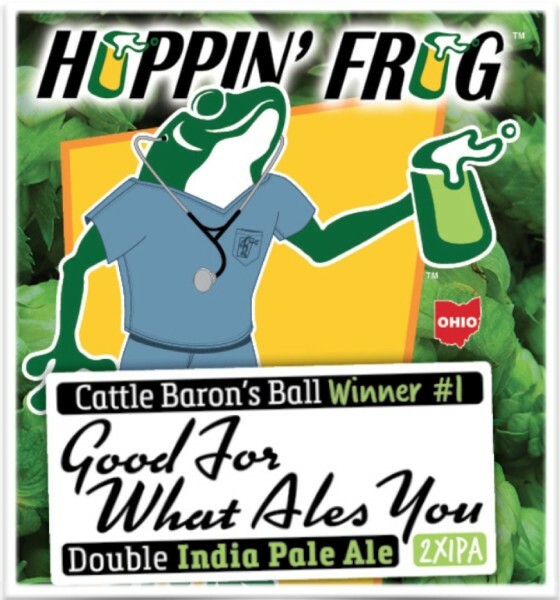 (Akron,OH) – American Cancer Society DOUBLE IPA Collaboration Beer Release: On February 6 at 3:00 pm, we will release Good For What Ales You DOUBLE IPA at Hoppin’ Frog Brewery!! See attached flier. 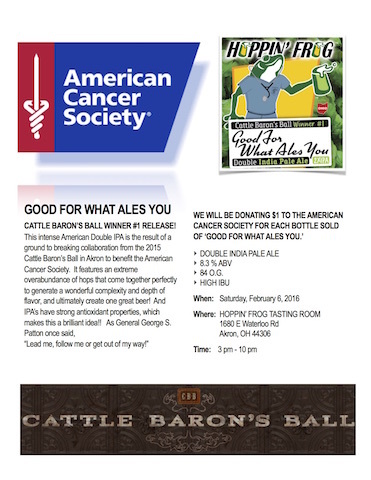 This is a verrrry special, super-flavorful collaboration beer made to benefit The American Cancer Society, brewed with Winner #1 of the Cattle Baron’s Ball in Akron. For the first 30 days, for every bottle purchased we will be donating $1.00 to the American Cancer Society, while supplies last. It will just be brewed once, and will be gone quickly, so stop by and gets yours! It features some of the best hops we have hand-selected from the hops presented to our brewers during the hop harvest last year, so it is TAAASTY!!! Good For What Ales You DOUBLE IPA will be on tap and also available in bottles to-go for $10.99 for a very limited time, so come and get yours while supples last!! We hope to see you here! !